Heritage Healthcare Wakefield has been named a finalist in this year’s Wakefield Business Awards. The home care company, which launched in August 2017, was nominated for the New Business Award, sponsored by Haribo. Heritage Healthcare Wakefield, operated by Managing Director Marie Binks and Registered Care Manager Magenta Jordan, delivers expert home care and support services to enable individuals in the communities of Wakefield and South Leeds area to remain living independently within the safety and familiarity of their own home. The care team has established a reputation within the local area for their ability to provide compassionate home care and support services, tailoring each service to the unique needs of individual clients. They have recently completed further training to become Dignity in Care Champions, and have supported their Dementia care service by hosting a bake sale for the local community. 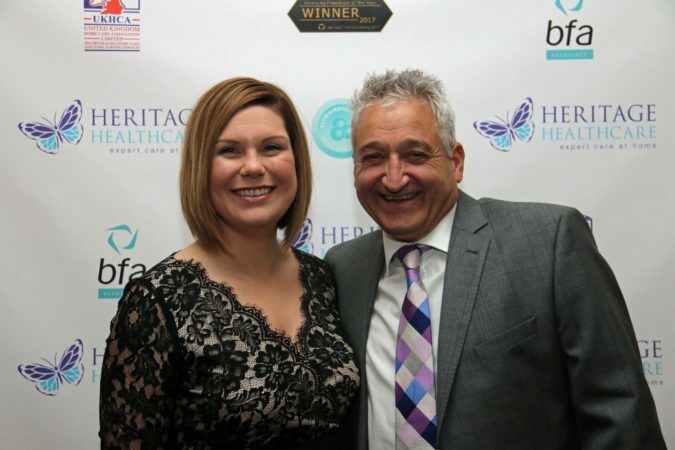 Heritage Healthcare Wakefield has already won a prestigious award having been awarded ‘New Franchisee of the Year’ during the Heritage Healthcare Annual Conference in November 2017. Being named a finalist for the New Business Award has rounded off a successful first year of business for the Heritage Healthcare Wakefield team. To find out more about Heritage Healthcare Wakefield, please visit www.heritagehealthcare.co.uk/wakefield for more information on the services they provide, or contact 01924 668944 for a discussion with the care team.